Having won orders in China, Vietnam and the Philippines, SCHADE Lagertechnik, member of the AUMUND Group of companies, has developed a leading position in the Asian power sector. Shanghai Electric Power Construction for GNPower Mariveles and Formosa Plastic Vietnam have both awarded large orders to Schade. In Shanghai, SCHADE Lagertechnik teamed up with the AUMUND subsidiary in Beijing, and won the order against strong local competition. “Measured in the combination of external diameter and stacking and reclaiming capacity, the circular storage machine to be installed for Shanghai Electric Power Construction will be one of the biggest that we have ever built in the 130+ years of our company history”, said SCHADE Sales Manager Andreas Markiewicz when describing the scale of the project. The diameter will be 130 m. It is an EPC project and will get underway this year. The circular storage will be installed in the Philippines and operated by GNPower Mariveles Coal Plant Ltd Co. This power plant is an expansion project by GNPower Mariveles, located close to some previously installed SCHADE machines on the Island of Luzon. GNPower Mariveles Coal Plant Ltd Co. was incorporated in 2007 as a subsidiary of GNPower Ltd. Co. in Pasig City. Commissioning of the circular storage is planned for 2018. Last year, SCHADE Lagertechnik had already won several orders for large circular and longitudinal storage machines in China and the Philippines. Currently two circular storage machines with diameters of 120 m each are being installed in Southern China for new power plants. In the Philippines, the order was awarded for a further phase of power plant projects. Nowadays, circular storage capacities of around 360 000 t are possible, and the equipment can be supplied in a completely explosion-proof design. In a few months time, SCHADE Lagertechnik will supply a portal reclaimer and a tripper car to Formosa Plastic for the Nhon Trach II project in Vietnam. This order includes installation and commissioning of the machines. 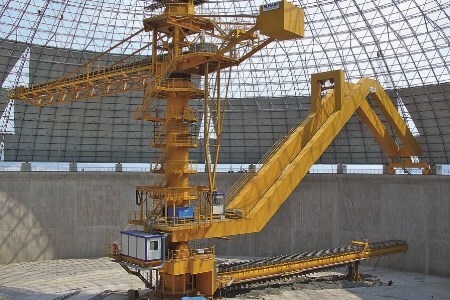 The portal reclaimer has a rail span of 54 m and is designed to reclaim 600 tph of coal, the same capacity as a slewing circular storage machine that SCHADE had supplied back in 2003 for the Nhon Trach I project. The diameter of that machine was 97 m.